YUMI™ Lash Lift uses a Keratin formula developed in Europe, as an alternative to lash extensions and growth serums. All YUMI™ products have no harsh chemicals and are hypoallergenic, formaldehyde free and cruelty free! The formula will not damage your eyelashes - in fact, the keratin will actually strengthen and nourish the health of your natural lashes! YUMI™ technology uses innovations based on the improvement of the natural structure of the cilium in each, individual eyelash. Our specialized technique and formula will lift each individual lash upwards to create the appearance of longer, fuller lashes. 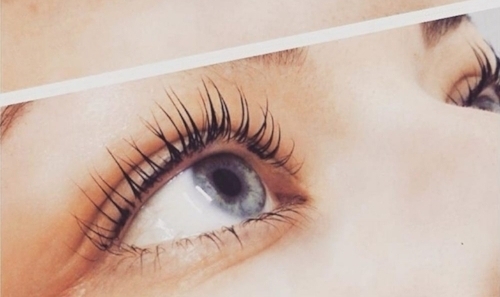 This lash lift is perfect for everyone with any eye shape and lash length. The lift and tint will enhance the natural beauty of your eyes and will last you 8 to 12 weeks! The procedure will lift your natural lashes and will include a lash tint to give you thicker, darker lashes. The entire session is a 5 step process that lasts about 60 to 75 minutes. The session will include an evaluation of your lashes to find the best lift and lash tint to give you a stunning, yet completely natural look. From there, you will rest with your eyes closed as we apply our nourishing keratin formula for the lash lift and tint.